Rapid Rhythms is made possible by a dedicated team of dancers and people who travel around the world to bring the best experiences to our West Michigan scene. If you want to get involved with Rapid Rhythms, there are many volunteer opportunities for you! Talk to any of our board members or email us at rapidrhythms@gmail.com to get started! Ike Swets is a dancer based in Grand Rapids, Michigan, and has been heavily involved in many of the different dance communities there since he first started with swing back at the very end of 2013. He is currently of the main organizers of the West Michigan swing dance scene, and has been teaching, DJing, and performing there and elsewhere since 2014. As an instructor, Ike values not only the dance itself but also the historical and cultural context of both it and its music, and he grounds his instruction in that. In class, Ike takes an accessible approach to topics, offering simple and focused explanations that create a learning environment anyone can thrive in. He designs his classes to make the material easy to understand no matter what the topic is, and has received praise but more importantly success from his students. He loves to meet new people and help them find the same inspiration and love for the dance that he did, so if you’re ever in class or see him at dance, please feel free to come say hi, introduce yourself, or grab a dance! 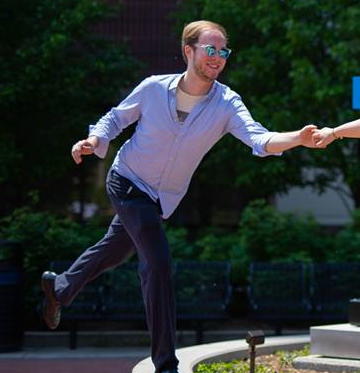 David started swing dancing with a simple east coast step in 2014. But from there the passion for dance ignited with the addition of Lindy Hop and later West Coast Swing. It didn’t take long for David to grow into a leadership role serving as a DJ and teacher for the Grand Rapids swing scene. As a teacher David hopes to share what moves him in the music and makes the dance a dynamic and fun experience. With a style that gives freedom to both partners the dance can be more than just a set of moves strung together but a real exchange of ideas while movin’ and groovin’. Sammi’s first foray into dancing began in middle school when she enrolled in a hip hop class. It didn’t last long, and she didn’t find dance again until she moved to Grand Rapids, Michigan in 2013. There she picked up east coast swing with a local group, and soon after she found and fell in love with Lindy Hop, and has been dedicated to the craft ever since. With years of both musical and dance experience under her belt, Sammi is able to use her knowledge and passion to help foster creativity and growth in her lessons. Her excitement and attitude is reflected in her movements, challenging anyone she dances with to step up their own game and have fun with the dance. Aside from dancing and teaching, you can find Sammi behind a camera taking pictures, doing graphic design, or playing a wide variety of games. Scott loves dancing and has been doing so for many years. When not dancing (or rather events that reside concurrently with dance) you will find him cooking, eating, or sharpening his mind through various physical and digital stimulus. Fueled by jazz and a need to cut a rug, Sarah specializes in solo and partner dancing from the swing era. She can frequently be found teaching at her home scene, as well as surrounding Michigan scenes. She’s known for her all-in styling, confident movements, and desire to dive deeper into the dance. Sarah began teaching in November of 2015 and is an original member of the Rapid Rhythms staff. Since joining the swing dance scene, Sarah has frequently traveled for dance and attended numerous classes from world-renowned instructors. She competes at every opportunity she gets and has placed in five competitions throughout her years. She coached the Rapid Rhythms Performance Team in 2018 and has appeared with the Frivolous Follies for chorus girl routines. Her classes are known for being upbeat and technique focused, with frequent laughter and dad jokes to boot.